These crispy mayo seafood spring rolls (nem hai san) are so satisfying with piping hot filling which includes crab meat, shrimp, and mayonnaise. Serve them with spicy mayo dip, lettuce, and mint, and they will disappear from the plate in no time. 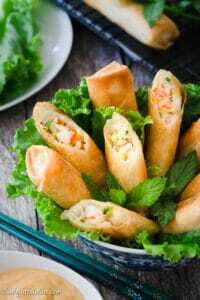 Fried spring rolls are called cha nem, nem ran or cha gio in Vietnam. They are extremely popular in all regions of Vietnam. You can find them at many street food establishments, in our daily home-cooked meals or our meals for special occasions. Every place and every family make their fried spring rolls differently. There isn’t a single spring roll recipe on which we all agree. I categorize Vietnamese fried spring rolls into three main types. This is the type most people in Vietnam will think of when you mention spring rolls in general. 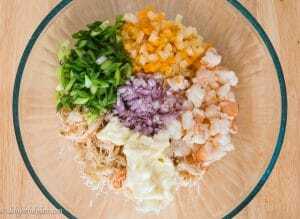 They usually consist of ground pork, cellophane noodles, dried shiitake mushroom, wood ear mushroom, beaten egg, bean sprouts and diced vegetables (such as carrot, jicama, and kohlrabi). We wrap them in rice paper wrappers and then fry them twice for extra crispiness. My family always put some crab meat and shrimp in these traditional rolls, but I know not everyone does this. However, I will tell you that good traditional fried spring rolls need at least shrimp in it. To me, this is the best spring roll in the world. There are two main differences between this type and type no. 1 above. Traditional rolls have a tubular shape while these rolls have a square shape. These square rolls, wrapped in big rice paper wrappers, are usually larger than the traditional ones, and the crust is amazingly flaky and crispy. The second difference is the filling. The main ingredients of these signature rolls are crab meat and shrimp. Yes, a lot of crab meat and shrimp. The rolls have minimal “filler” ingredients. 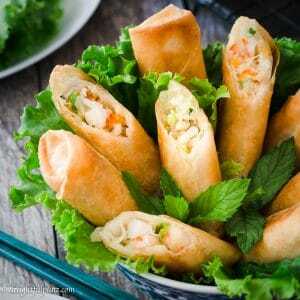 These mayo seafood spring rolls are mainly popular in Hanoi, the capital of Vietnam. They include crab meat, shrimp, carrot, onion, and mayonnaise. The recipe today is for these rolls, and they are so delicious that I believe they can please all picky eaters. Restaurants in Hanoi usually coat them with panko before frying. I wrap them with spring roll wrappers, and I don’t add the panko coating. It’s much quicker, less messy and the spring rolls are still perfectly crispy. Please make sure you buy spring roll wrappers that don’t contain eggs. They provide a smoother and crispier skin than egg roll wrappers. I use the Spring Home brand, and you can find them in the freezer at Asian grocery stores. I use snow crab for these mayo seafood spring rolls, and if I could get dungeness crab here, I would gladly use it. Please use good-quality crab meat for the best result. All ingredients are quickly sautéed to cook off the moisture before we wrap the rolls. Since I prepare spicy mayo dip, I don’t want to go overboard with the amount of mayo in the filling. If you like creamier and richer filling, go ahead and add 1-2 tablespoons more than called for in the recipe. 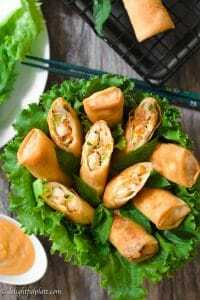 Because all ingredients in the filling have been sautéed, you only need a few minutes to fry the spring rolls, just enough for the skin to turn golden brown and crispy. Crisp lettuce and mint are great accompaniments since they add aroma and brighten up these spring rolls. These crispy mayo seafood spring rolls are so satisfying with piping hot filling which includes crab meat, shrimp, and mayonnaise. They are so delicious that they will disappear from the plate quickly. Prep all the veggies: dice carrot, onion, shallot and thinly slice scallion. Place a pan over medium high heat. When the pan is hot, add oil and add onion. Stir and cook for 2 minutes until fragrant, then add carrot. Continue to stir and cook for another 2 minutes. Transfer to a plate lined with paper towel to cool. Add some more oil to the pan if needed and then add shrimp. Stir and cook over medium high heat for about 1 minute until shrimp is about 80-90% cooked. Set aside on a plate lined with paper towel to cool. Add oil if needed and then add crab meat. Stir and cook over medium high heat for about 1 minute. Set aside on a plate lined with paper towel to cool. 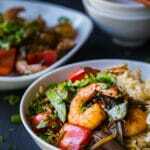 When onion, carrot, shrimp and crab have cooled down, add them to a mixing bowl. Add mayonnaise, shallot, scallion, fish sauce and a generous amount of black pepper to the bowl and mix well. Place one spring roll wrapper on a clean cutting board or working surface. Put 1 1/2 to 2 tablespoons of filling on it, shape into a log. Fold the top corner of the wrapper near you over the filling, fold left and right corners over the filling, and then roll it up away from you. Place on a tray or plate, seam side down. Repeat with the remaining filling and wrappers. Heat at least an inch of oil in a frying pan. When the oil reaches 350F, add the spring rolls and fry over medium-medium high heat until golden brown and crispy (just 3 minutes or so). Only fry 4-6 spring rolls at once. 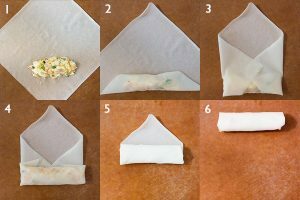 Transfer fried spring rolls to a colander lined with paper towel, place them in an upright position to drain excess oil. Whisk together all ingredients for the spicy mayo dip. Serve spring rolls with spicy mayo dip, lettuce and mint. I love spring rolls! Om nom nom! 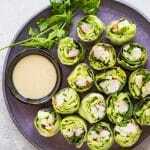 You have so many so many wonderful tips for the spring rolls – I love that! 🙂 I had no idea that eggs in spring rolls made a less smooth spring roll! I will need to try some real crab meat and make this. Terry likes the fake crab meat -_- and always asks me to make it with that but this time i’ll be in charge!! 🙂 Do you usually buy your crab meat frozen? Or do you pick it out from the shells? Hi Joyce! 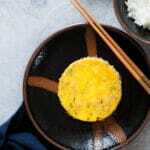 It’s fine to use eggs in spring roll filling. However, if the wrappers contain eggs (like egg roll wrappers), the skin will not be as smooth 😀. I start buying snow crab legs and pick out the meat from the shells recently because it’s so much better than the refrigerated packaged crab meat in terms of both flavor and texture. I believe the legs have been previously frozen but the quality is still good. My hometown is close to the sea so I used to buy live crabs to cook haha. That’s unfortunately not an option anymore as I’m in the Midwest now.